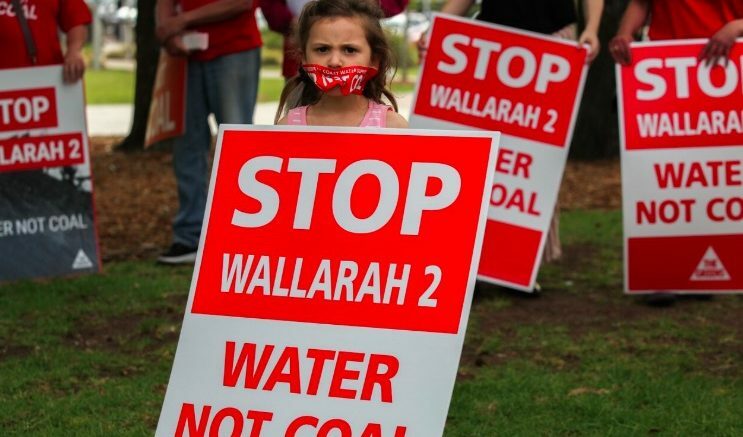 Scene from a recent protest against the Wallarah 2 proposal. Image: Alex Herget - parental permission granted for singular publiser use. The Australian Coal Alliance (ACA) held its Annual General Meeting on October 27. ACA Treasurer and Executive Member, Mike Campbell, who chaired the meeting, confirmed that there were 245 individual paid-up members of the Association. In addition, there were numerous group members of the Association, which comprise of various Central Coast community organisations that have supported the ACA for more than 20 years. Campbell said he thanked former Wyong Councillor and Mayor, Bob Graham, for his continuing role as patron of the ACA. The ACA members voted to keep the previous executive members of the Association, including Alan Hayes as Campaign Director and spokesperson. Alan Hayes addressed the members and spoke about the long campaign to stop coal mining beneath the Central Coast’s critical water catchment district. He gave a brief overview of the upcoming court case in the Land and Environment Court (LEC) challenging the validity of the approval granted to Wyong Coal Pty Ltd.
“I encourage all members, family and friends to attend the rally on the day of the commencement of the court case, Monday, November 12, at 10am, in the Domain, behind Parliament House,” Hayes said. The challenge to the validity of the coal mine approval in the LEC is expected to run for four days.